For those of you who want to ask when and why one individual may need to transfer files from Samsung to iPhone 8 (and even the new iPhone X Plus, iPhone Xs or iPhone Xs Plus), here are some of the more common. You just purchased a new iPhone 8 and plan to give away your old Samsung Galaxy S9/S8/S7/S6/S5; you want to share your interesting pictures and videos on your Samsung Galaxy with your friend's iPhone 8; or you just have a Samsung and iPhone XS/X Plus/9/8/X/7/6S at the same time and need to transfer files between the two. Since Samsung and iPhone 8/X are running different OSes, the transfer process seems not easy. Don't panic! By following the two solutions described in this article, your Samsung phone data will be quickly and safely transferred to iPhone 8. What's more, the steps are secure and simple. Just keep on reading. Coolmuster Mobile Transfer (with its Mac version) can be described as a 3rd party application that can assist the user with initiating and completing transfers from one device to another. For instance, if a user has a need to transfer all of their data from their Android device like Samsung Galaxy S9/S8/S7/S6/S5 to another platform like iOS, such as iPhone XS/X Plus/XS Plus/8/X/7/6S, they can make these kinds of transfers easier and much simpler to do. - Supports most popular phone OSes, including iOS and Android. - Almost everything can be transferred, including contacts, SMS, photos, videos, music documents and so forth. - The transfer tool can backup and restore your phone on computer with one click (this function will come soon). - It supports almost all Android devices like Samsung, HTC, HUAWEI, LG, ZTE, Sony, etc. - It is compatible with iPhone, iPad and iPod touch. Following is a 3-step guide on how to use the Samsung to iPhone Transfer - Coolmuster Mobile Transfer to transfer files from Samsung to iPhone 8. You should get these things prepared: Samsung phone with USB cable, iPhone 8 with Apple provided USB cable, a computer, a piece of Mobile Transfer. Download and install Mobile Transfer on a desktop computer. Launch it and then connect 2 USB cables to the computer and each device (Samsung Galaxy and iPhone 8 devices). When both devices have been connected as described above, the user will see a new window that shows the two mobile devices and all the different types of data that can be transferred. Tick off the file types you want to transfer and then click on the "Start Copy" button to begin and complete the data transfer from Samsung to iPhone 8. If you want to transfer files from iPhone to Samsung, you can click "Flip" to switch their places. When the copying data process is complete, the selected data are successfully transferred from Samsung Galaxy phone to iPhone 8. Please keep the two devices connecting to the computer during the whole transferring process. Samsung Kies is introduced by Samsung company, which can help you transfer and manage Samsung phone data with ease. If you have ever backed up your Samsung Galaxy data on Samsung Kies, we have a tool to help you restore the backup data from Samsung Kies to iPhone 8 directly, all what you need is the Phone Transfer tool. Fist of all, you may want to learn how to back up Samsung data to Kies. Step 1: Connect Samsung phone to PC and select "Backup & Restore"
Launch Samsung Kies on your computer and connect your Samsung phone to the same computer via USB. Once successfully connected, choose "Backup & Restore" option and click "Data Backup". Then, Kies will divide the Samsung phone data into two categories: Personal information and Content. 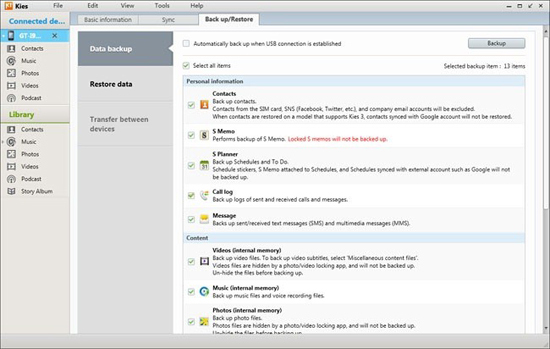 Select the data you need to backup and hit the button of "Backup" at the top-right corner to start the backup process. You can directly choose the media files backup on your computer, but for messages and call logs backup, you have to install additional software to access them. Step 1. 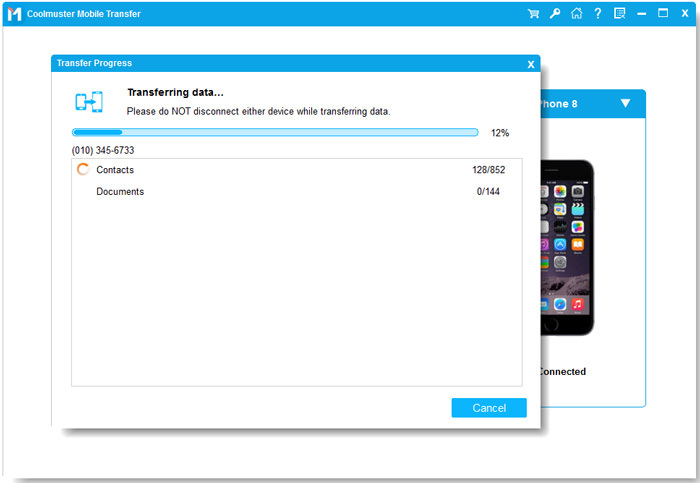 Download and install Phone Transfer tool on your PC or Mac. Step 2. Launch the tool and select "Restore from Backups" in the primary interface. Then, choose "Kies" in the options presented. Step 3. Connect your iPhone X to your computer via a USB cable, then choose a Kies backup file as you like on the left menu bar. Step 4. All the transferable file types are listed in the middle of window. You are allowed to select the file types that you wanted, and simple click on "Start Transfer" to sync them to your iPhone 8 in a click. As you know, Samsung Kies only works for Samsung devices. Therefore, if you want to perform data transfer from other Android devices to iPhone, the solution 2 will be helpless. Coolmuster Mobile Transfer supports almost all Android and iOS devices and can realize the file transfer in simple one click. So, it is no doubt that using Mobile Transfer is a wiser choice.